1 of 4 Heat oven to 450 degrees F. Coat a large baking sheet with nonstick cooking spray; set aside. 2 of 4 Heat a large nonstick skillet over medium-high heat. Crumble sausage into skillet and add peppers and onions. Sprinkle with Italian seasoning and black pepper; cook for 9 minutes. 3 of 4 Remove skillet from heat; drain off any fat. Stir in cheese and tomato sauce. 4 of 4 Divide dough into 6 pieces. On a floured surface, roll each piece into a 7-inch circle. Place a heaping 2/3 cup filling onto one half of each circle. Fold dough over filling; press edges together firmly to seal. Cut 3 slits through tops. Repeat with remaining dough and filling. 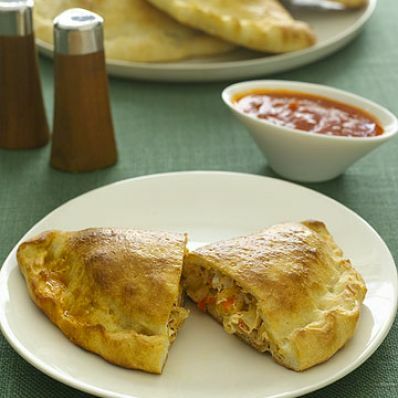 Place calzones on prepared baking sheet. Bake at 450 degrees F for 15 minutes. Cool slightly before serving. Serve with marinara sauce, if desired.